Warner Bros. has unveiled the official trailer for Justice League Vs. the Fatal Five, their latest animated DC Comics adaptation. They've also revealed that the upcoming title will hit digital retailers on March 30, with physical Blu-ray/4K copies arriving on shelves on April 16. As for the trailer, it's absolutely epic in scope and loaded down with action. 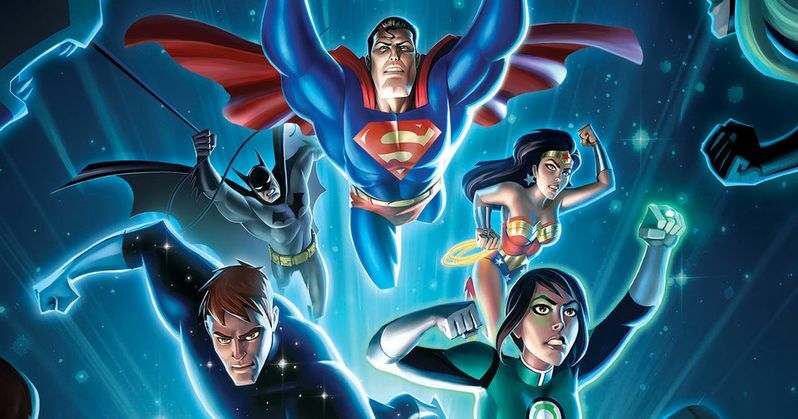 It's also done very much in the style of the beloved Justice League cartoon, which should delight DC fans. Justice League vs. The Fatal Five sees Superman, Batman and Wonder Woman trying to find answers as the time-traveling trio of Mano, Persuader and Tharok terrorize Metropolis in search of up-and-coming Green Lantern, Jessica Cruz, who they intend to use in order to free the remaining Fatal Five members, Emerald Empress and Validus. The cast includes Elyes Gabel (Game of Thrones) as Thomas Kallor/Star Boy, Diane Guerrero (Orange is the New Black) as Jessica Cruz/Green Lantern. Kevin Conroy (Batman: The Animated Series as Batman, Susan Eisenberg (Injustice 2) as Wonder Woman and George Newbern (Superman vs. The Elite) as Superman. The Fatal Five are voiced by Peter Jessop (Resident Evil) as Tharok, Matthew Yang King (Batman Ninja) as The Persuader, Sumalee Montano (This Is Us) as Emerald Empress and Philip Anthony Rodriguez (Grimm) as Mano. As for Validus, he doesn't speak. The cast is rounded out by Daniela Bobadilla (Anger Management) as Miss Martian, Kevin Michael Richardson (Family Guy) as Mr. Terrific, Noel Fisher (Shameless) as Brainiac 5, Tara Strong (Teen Titans Go!) as Saturn Girl and Tom Kenny (SpongeBob SquarePants) as Bloodsport. Additionally, the studio has revealed what bonus content will be included on the Blu-ray, 4K Ultra HD and digital copies of the movie, which are as follows. Battling the Invisible Menace (Featurette): This explores the nuanced hero as many characters must deal with the everyday feelings of anxiety, depression, and other incapacitating emotions that we all must battle and overcome. Justice League vs. Fatal Five: Unity of Hero (Featurette): This takes a look at the diversity and inclusivity of the current DC universe, with writers and artists breaking boundaries and stereotypes. Audio Commentary: Commentary track from Bruce Timm, Sam Liu, Jim Krieg and Eric Carrasco. A Sneak Peek at the next DC Universe Movie, Batman: Hush: An new look at the upcoming adaptation of the beloved graphic novel Hush. Sneak Peek Revisited: A Preview of Justice League Dark: A look at the John Constantine-led DC animated feature that chronicles the dark version of The Justice League which takes on malevolent forces that go beyond our plane of existence. Sneak Peek Revisited: A Preview of Justice League vs. Teen Titans: A look at characters known as the Teen Titans. Sam Lieu (Gotham By Gaslight directs from a script by Eric Carrasco (Justice League Action). Justice League vs. The Fatal Five will be available in a 4K Ultra HD Combo Pack for $39.99, Blu-ray Combo Pack for $24.98 and digital, which goes for $19.99 in HD and $14.99 in SD. Be sure to check out the new trailer from the Warner Bros. Home Entertainment YouTube channel below.